Plays a role in the oxidation of abdominal fat. May also reduce symptoms of depression and the effects of ageing. 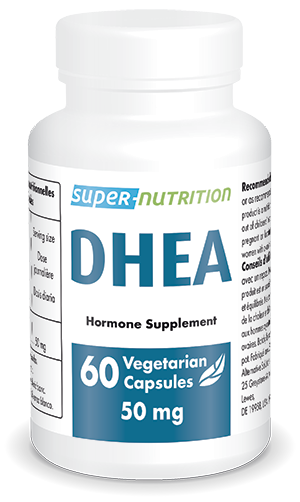 DHEA is the substance from which your body makes other hormones such as testosterone, estrogen and Progesterone, and it is known to be an essential component in many physiological functions in the body. Indirectly DHEA supplementation generates an increase of the IGF-1 level (a growth hormone metabolite), which could be one of the possible reason for its health benefits. DHEA is naturally produced in the human body, mainly by the adrenal glands. It circulates in the body mostly in its water-soluble form, called DHEA-sulfate (DHEA-S), its level can be easily measured. adults. Take one vegetarian capsule every day with food, or as recommended.